Who doesn’t have hair issues? I know I do, so I took the trouble of scouting some products you’ll want to take center stage of your shower. Although I’ve only tried it three times, Belegenza’s GrowOut Shampoo and Strengthener actually seemed to make my hair look and feel thicker. The food-grade formula includes a “vitamized peptide complex,” which they claim stimulates follicle anti-aging. It removes all synthetic ingredients from previously used products and they say their research shows 67% of volunteers had an increase in new hair growth! About $25 for 8 ounces. Unite Eurotherapy’s 7Seconds Condition Leave-in Detangler (about $20, 8 oz) is touted as Eva Longoria’s favorite, but this salon product does just what it claims–detangle your hair in 7 seconds. It also helps lock in color and provides UV protection. Their Expanda Volume Root Energizer (about $14, 8 oz) gives a great lift to fine hair, but can be used sparingly on fuller hair for improved body. I tried the Bosley Professional Strength Volumizing & Thickening line, including the Styling Mousse (about $13, 6.6 oz) and Hairspray ($18, 9 oz). While it did give volume to my hair, the mousse also made my hair feel a little bit tacky. Their hairspray, on the other hand, is terrific. I now use it all the time. I spray it on and then run my fingers through my hair. The style stays, but loosened up. Good stuff! My favorite volumizing product? göt2b fat-tastic instant Collagen infusion. This stuff is awesome! 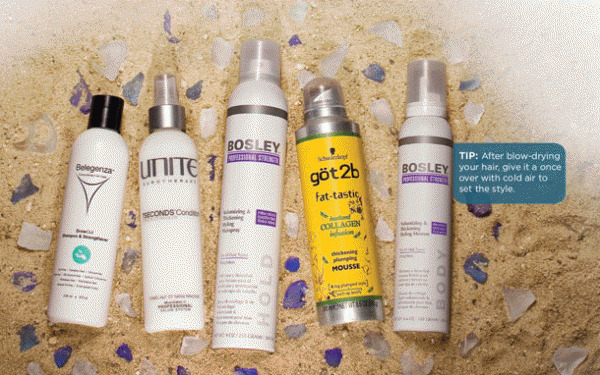 It’s a root-boosting spray that really gives a great lift without making your hair stiff. The applicator could be made to better suit hitting the roots (the spray could be narrower), but that’s a small gripe compared to the results it delivers. About $11 for 6 ounces. With the hot and humid days of a Long Island summer nearly upon us, you will want to check out göt2b Smooth Operator Hair Spray. Infused with cashmere (! ), this finishing spray will smooth your hair and tame those frizzies right down. It provides a milder hold, keeping your style loose and very touchable. About $10 for 9.2 ounces. In a hurry? Salon Grafix’s Invisible Dry Spray Shampoo is the first dry shampoo I’ve ever used that actually works. Spray it on, let it dry for one minute, then brush thoroughly, and your hair is given a six hour reprieve from the need to shampoo! I used it recently when I had “spa head”—full of facial and massage products. I was going out that night and I didn’t want to shower off all the good stuff my skin took in that day, so I used this spray and to my delight, it did the job! About $5 for 4 ounces. TIP: After blow-drying your hair, give it a once over with cold air to set the style.